Chelsea advanced to the Carabao Cup quarter-final after claiming a 3-2 victory over Derby County on Frank Lampard’s return to Stamford Bridge. Impressive in beating Manchester United in the third round, Lampard’s young side were the architects of their own downfall in London as Chelsea loanee Fikayo Tomori and Richard Keogh both put through their own net inside 21 minutes. The inexplicable error was quickly forgotten as Marriott, a scorer against United, capitalised on Gary Cahill’s slip to drive an unerring low finish across Willy Caballero. A stumbling Waghorn passed up a one-on-one chance to complete a quickfire turnaround and Derby punished themselves through more calamitous defending. In eerily similar circumstances to the first, the experienced Keogh sliced another right-sided Zappacosta cross past a bewildered Scott Carson. Still, the visitors were just as dangerous going forward as they were in their own box and snatched a second equaliser after 27 minutes, Mount squaring for a Waghorn tap-in. 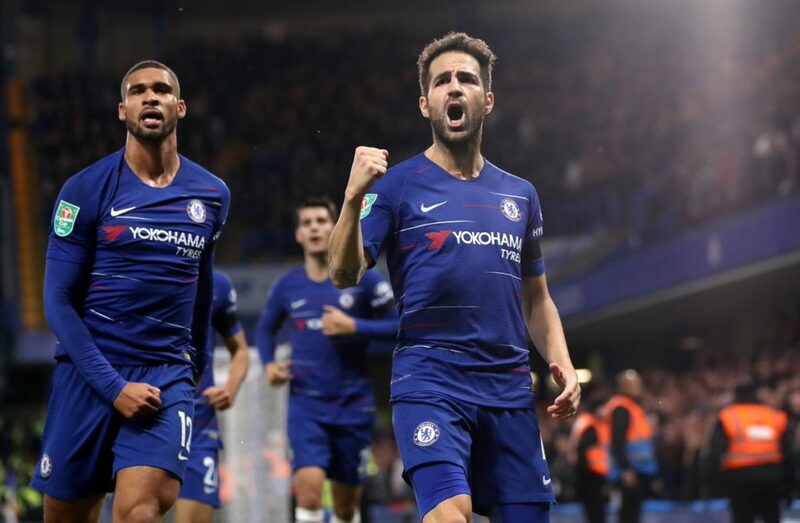 But they failed to plug the leaks and it was no surprise that Fabregas forced home the third for Maurizio Sarri’s side from close range in the 41st minute. A quieter second half eventually livened up, with substitute Nugent turning the last of three Derby openings into the base of the far post, forcing Lampard to settle for the consolation of receiving the adulation of the supporters, who consistently sung his name. Cahill and Andreas Christensen, paired in the heart of defence, have both expressed interest in leaving Chelsea if more regular opportunities are not forthcoming. On this evidence, Antonio Rudiger and David Luiz will not be dislodged any time soon. He may never be much more than an understudy to Cesar Azpilicueta, but right-back Zappacosta at least left an imprint of his attacking ability in Sarri’s mind, the Italian having been involved in all three Chelsea goals. Ex-England defender Cahill was particularly exposed on Wednesday with his slip in the lead-up to Derby’s initial equaliser the first disappointing moment of a match in which his waning pace was problematic. Stamford Bridge is again the setting for Chelsea’s clash with Crystal Palace in the Premier League on Sunday, while promotion-chasing Derby host Birmingham City in the Championship on Saturday.